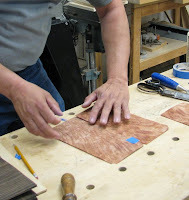 This past Sunday, I took a class taught by Jonathan Benson on Veneering & Inlay. 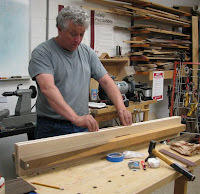 Jon is a graduate of the Rhode Island School of Design with pieces exhibited in over 40 galleries nationwide, has taught college level woodworking for over ten years, has written for publications such as Woodshop News and Woodwork Magazine and has recently written a book entitled Woodworker's Guide to Veneering & Inlay. Jon explained the different ways that veneer is cut from a log, depending on how it will be used, and the benefits to using veneer over solid wood. One reason in particular is sustainability. 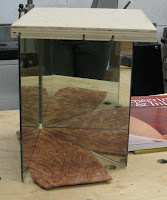 Wood cut into veneer can cover a whole lot more surface area than its solid wood equivalent. He explained bookmatching, 4-way (and more) matching, arranging pie shapes, cutting diamond shapes, and applying veneer to curved surfaces. Veneering began in ancient Egypt, 5,500 years ago, where thin pieces were cut from a tree with an adze and made smooth with stones. 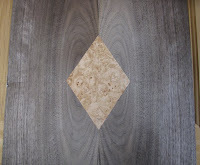 Even though the veneer was 1/4" thick, it made the best use of the wood that was scarce and precious to the Egyptians. 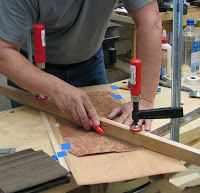 Jon demystified veneering and inlay for me and demonstrated just how easy it is. I made my first inlay, using bookmatched walnut and a piece of birdseye maple, and although I haven't glued it to a substrate yet, it came together with little effort. 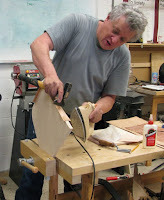 In his book, Jon explains exactly how to work with veneer; its history; how it is produced from a log; how to repair it; how to arrange it for spectacular geometric patterns; how to make a jig which utilize s a mirror to determine the best cut; how to make a jig that secures the veneer while you square the edge; how to create inlay, parquetry, and marquetry; how to work with curved projects; how to make your own veneer; and how to build a curved mirror frame, along with step-by-step instructions. 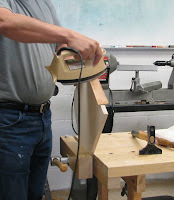 Working with veneer not only opens up a whole new aspect to woodworking, it enables you to work with wood which in its solid form might be cost prohibitive, and allows you to feel good about helping to sustain our forests.